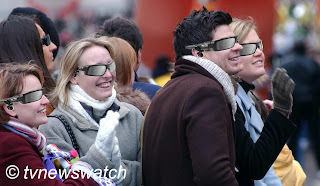 Google is reported to be experimenting with 'terminator-style' glasses with heads-up-display [HUD] which would allow users to interface with the Internet. According to reports the HUD glasses would sport an earpiece and be equipped with voice input allowing users to pull up maps, web pages and other information. While the project is still in a development stage it could prove to be a hit with some technology geeks, though many people might feel awkward as the walk along the street apparently talking to themselves as they call up directions or Internet pages on the move. When bluetooth earpieces surfaced some years back they provided an excellent way to use a mobile phone more safely while driving. However their use outside a car created a bizarre spectacle as users could be seen apparently having an argument or conversation with themselves. With speculation that navigation might involve subtle tilts of the head, the HUD glasses might result in even stranger sights in the high street. Are we to see an army of people sporting dark wrap-round shades nodding their heads uncontrollably while loudly asking for directions to the Nag's Head public house?